In addition to assembling the six remaining tunes in my Batman songs collection for you, this episode debuts Mobile Uncle Warren, as I introduce the songs while driving to work and talking to my new digital recorder. I promise not to use it too often - unless you want me to! "Ho Ho Ho The Joker's Wild"
"Look Out For the Batman"
And once again, warning: Listening to these songs all at once may make your brain explode. I won't take responsibility if you ignore this warning. And thanks again to Red for another stellar cameo performance, this time as herself. To download click the Pod icon or this link. Unsurprising data here: my son loved this show, while the only thing saving my brain from an ugly explosion was my inability to attend fully to the songs, as I was working in the kitchen at the same time the podcast was playing. I'm listening right now. I'm on the second song and I'm not experiencing any pain. This is cool! It reminds me of coming home after school and running straight for the television for Scooby-Doo and Gilligan's Island and The Monkees and stuff like that. The in-the-car schtick is cool, too. Can I ask what recorder you're using and does it save stuff as .mp3s or do you have to convert? 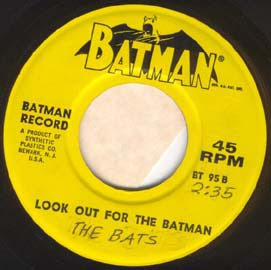 Having one of those Batman 45's myself, I kinda assume they were put out by Peter Pan Records as I noticed a company name "Synthetic Plastics" listed on them (they operated under numerous labels in their history including Peter Pan). The Album compilation though used "Tifton" as the label name.